FLINTSTONE, Md., Nov. 7, 2016 — There’s never been a hard count taken of first-time ultra marathoners before the start of any of the first five Fire on the Mountain 50K ultra marathons. This year’s count, though, stood out because all 24 runners were asked, and only one responded yes. 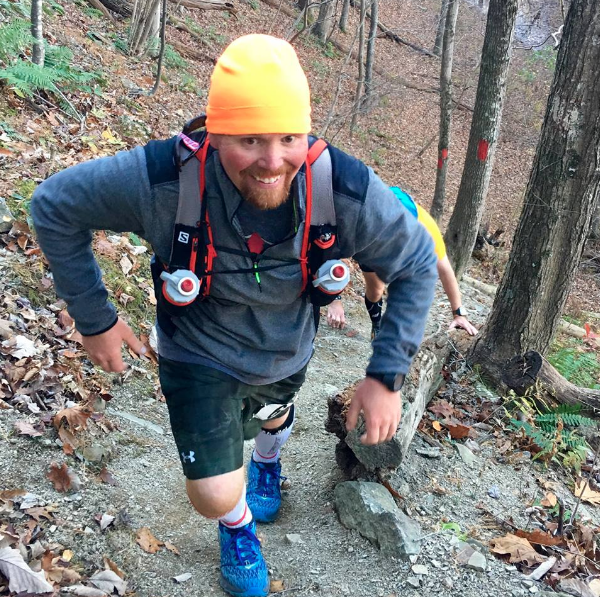 Waylon Burke, 35, of Morgantown, W.Va., was the only runner to raise a hand in the affirmative to declare the sixth running of the Fire on the Mountain 50K in Green Ridge State Forest. Waylon Burke tackles a section of the red (Long Pond) trail, which encompassed roughly the first quarter and last quarter of the race. It is the only time in the event’s six-year history in which only one runner was attempting his or her first ultra marathon. Once Burke identified himself at the start line, members of the low-key field that included 10 members of the well-honed Virginia Happy Trails Running Club (more on the VHTRC below) cheered and clapped and, for all intents and purposes, let him know he wouldn’t be alone on the course. And judging by the results, he wasn’t. Burke finished less than 2 seconds behind VHTRC member Jenny Roberts. Burke completed the course, estimated to cover 32.8 miles, in 19th place overall in 8 hours, 27 minutes and 9.5 seconds. A day later, he wrote the race director while reflecting on his experience, which was witnessed on race day by his parents, Rodney and Sherry Burke. His parents volunteered at each aid station and waited an appropriate amount time before moving on to assist at the next aid station. For Burke, it was a good day to be in the woods. Several runners had asked for detailed elevation information prior to race day. The race director, Kevin Spradlin, doesn’t run with such fancy watches or record such data. Before the race, Spradlin was only able to provide profile information of each trail that offered only the highs and lows of each trail section — but no combination of data that detailed the level and number of climbs runners traversed throughout the day. Waylon Burke was happy to provide his Strava data for use of the event, staged by the Potomac Highlands Distance Club based in Frostburg, Md. 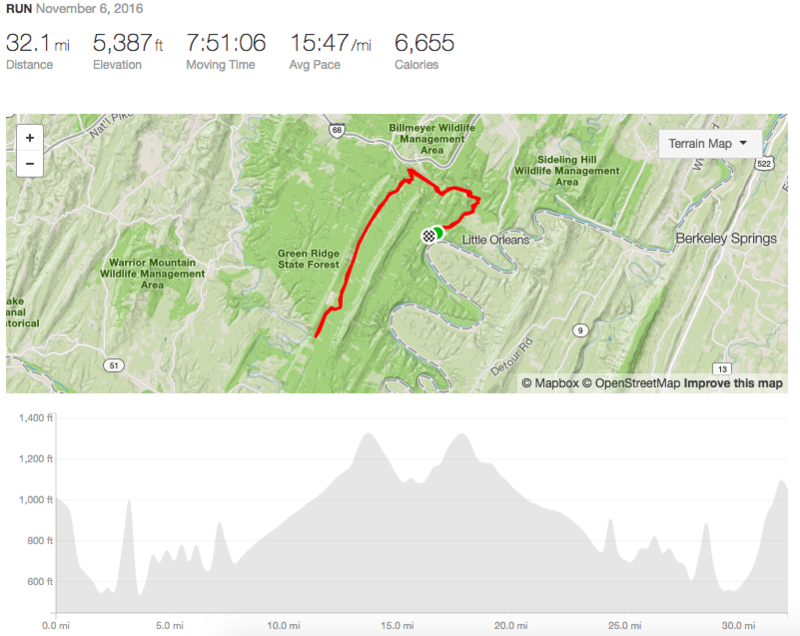 According to his watch and Strava, FOTM is a 32.1-mile course and offers 5,387 feet of elevation change. Benshoff covered the first half of the course in 2 hours and 59 minutes. It didn’t take her that long to go back. Having run the course in a training run in October, she knew the course better than most first-time FOTM participants. She managed to cover the second half of the race in 2:52:32.5. Benshoff was the only contestant of 23 finishers to post negative splits. The 24 starters were split by gender, including 15 men (62.5 percent) and nine women (37.5 percent). The 24 starters had a combined age of 885 and an average age of 36.88. By gender, the average age was 39.67 (male) and 40.89 (female). To be fair, it should be noted a woman (Michelle Benshoff) won it — by a lot — and, along with Sarah Mikalauskas, women held two of the top four spots. By far, this year’s 24 starters and 23 finisher comprised the smallest field in event history. That was largely done on purpose in order to test out the new out-and-back course in terms of congestion, aid stations and other logistics. From that perspective, the new course layout seemed to work well. In 2014, there were 60 individual finishers along with four two-person relay teams. In 2013, there were 109 individual finishers along with, again, four two-person relay teams. In 2012, there were 79 individual finishers along with seven complete two-person relay teams. In 2011, there were 57 individual finishers and five relay teams. In 2010, there were 45 individual finishers with two complete relay teams. 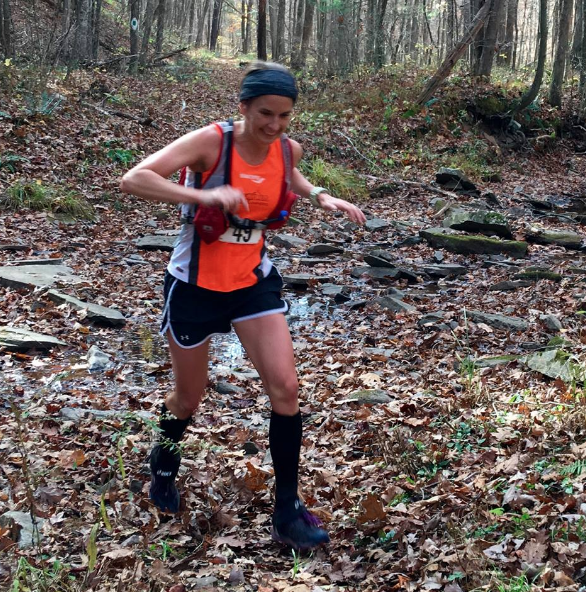 Michelle Benshoff’s dominant performance in this year’s Fire on the Mountain 50K was lauded well into the wee hours of Monday morning, but her win and overall time on the new and, arguably more difficult course deserves a closer look. Benshoff managed to become the first female runner to win Fire on the Mountain outright, ran to the fourth-best FOTM performance by a woman in the event’s six-year history and the No. 1 time by a female FOTM finisher age 40 or older. The fact that the harrier from Waynesboro, Pa., ran virtually the entire second half of the race by herself, unaccompanied by other runners, makes the feat all that more impressive. Benshoff entered Aid Station 2 (Mile 8.9) in fourth place, only two seconds behind Mike Shoemaker and less than four and one-half minutes behind leaders Ryan Kidwiler and Erik Price. At Aid Station 4 (Mile 16.4), Benshoff was third, and a mere two minutes behind second-place Kidwiler. Overall winnr Michelle Benshoff showed grit and determination by posting the fourth-fastest time by a female FOTM finisher in the race’s six-year history. She did much of it alone. On the return trip, however, Price got of course and Benshoff pulled ahead of Kidwiler. At Aid Station 6, with 8.9 miles to go, Benshoff checked in at 4:11:30. Kidwiler was next in at 4:24:13. The 12-minute gap only grew, and Benshoff’s closest competitor (Kidwiler) made it to the finish line about 32.5 minutes after the overall winner. In 2014 when Kari Brown set the then-No. 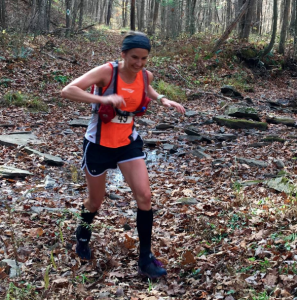 4 best mark by a woman, she finished 12th overall among 45 finishers — but less than two minutes behind Paul French, of Warfordsburg, Pa.
Twenty-three of 24 starters finished the race, resulting in a 95.83 completion rate. Ten of this year’s 23 finishers (43.5 percent) were members of the Virginia Happy Trails Running Club. A huge “thank you” to the club for supporting the return of this race. The 2017 version of the Fire on the Mountain 50K, the seventh running, will be staged on Sunday, November 5. As in 2016, the race will fall on the same day as the end of Daylight Saving Time. The time change provides an opportunity for an earlier start, and it’s likely the race will begin at 7 a.m. (instead of 7:30 a.m.) in order to increase the official cutoff time to 10 hours (up from nine and one-half hours this year). Potomac Highlands Distance Club Copyright © 2019. All Rights Reserved.